Above: Our Saviour's building until 1995. Below: Our current building on the same corner of 24th and Chicago Avenues. Our Saviour’s Lutheran Church formed in 1869 around a group of Norwegians who had banded together for the purpose of promoting religious worship in the newly formed frontier town of Minneapolis. With the assistance of a visiting minister from Red Wing, Minnesota, this group formed as a congregation on December 6, 1869. From its roots, Our Saviour’s has nearly always considered itself a small, courageous and evangelical, mission-oriented church. Even as it was working to house its congregation in its own worship space, dedicated in June of 1871 at Washington Avenue and 10th Avenue South, Our Saviour’s was involved in forming other “chapels” and worshiping communities in various parts of the city. Many of these developed into their own congregations and still exist today. As the congregation grew, and as the residential population shifted south away from the riverfront milling district, the congregation shifted sites. It moved first to 7th Street and 14th Avenue, then, in 1912, settled at its present location, 24th Street and Chicago Avenue. Buildings were erected, programs created, missions dedicated, and with them membership flourished. Under the early direction of pastors Ylvisaker, Stub, Vangsnes, J.W. Preus, Hoff, and H. Preus, the congregation developed certain visions -- for worship, education and outreach. These visions have been solidly in place through the many changes that its Phillips neighborhood has undergone. 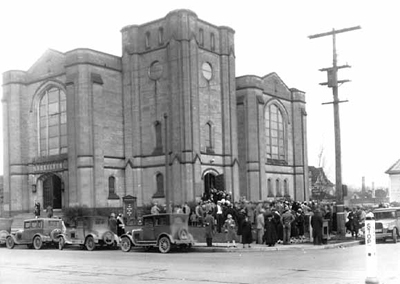 Music and educational focus and the promotion of religious worship strengthened the identity of Our Saviour’s so that by the early 1960’s, as the congregation neared its 100 year anniversary, membership had swelled past 3000; the congregation had a place as a leader in the American Lutheran Church community. Population shifts and community changes in the Phillips neighborhood brought new sets of immigrants to the neighborhood. The congregation held firm to its desire to be a courageous church of service, and efforts to reach out to new neighbors continued. Pastors Sorteberg and Rudrud ably led this vision. While the Norwegian roots seemed to be ever-present within the worship space, the identity of Our Saviour’s gathered African American, Native American, Hmong, Hispanic, and Liberian influences into its tapestry. As mission and outreach programs developed and grew and moved on to become organizations of their own, new initiatives sprung up behind them. Although the membership numbers dwindled through aging, and demographic shifts saw many members move into the suburbs, a small core group dedicated to promoting religious worship never disappeared. New leadership within continued to build and rejuvenate. In the 1990’s, the aging building posed its own problems for the small congregation. Members struggled with maintenance, renovations, energy use, and the use of a large space once filled with its own bustling activities. Various plans and visions were debated on what the future of Our Saviour’s could look like. The devastating fire of December, 1995, destroyed the gothic sanctuary, but did not put out the spirit of the congregation that had worshipped there for 83 years. 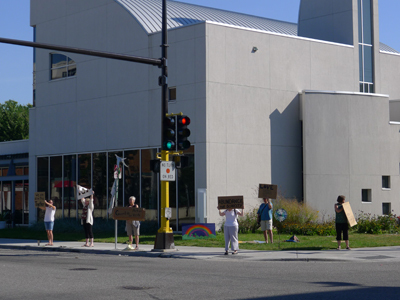 During a period of recovery and reflection, the congregation held services in a borrowed space at Lutheran Social Services. New visions arose. With faithful dedication, the congregation rebuilt, raising its present-day modern building on the same corner of 24th Street and Chicago Avenue. Pastors Tidemann and Lee led the congregation, still with the same purpose of promoting worship, supporting educational efforts, and looking outward to the community Our Saviour's is called to serve.